A deviated septum occurs when the thin wall that separates the left and right nasal passages (the septum) is displaced to one side. This nasal condition can occur due to an injury to the nose, or it can be present from birth. A deviated septum can be corrected through a surgical procedure called septoplasty. It can also be corrected during a rhinoplasty (nose job) procedure. The difference between septoplasty and rhinoplasty is the fact that the former only fixes the deviated septum while the latter can fix other aspects of the nose as well. 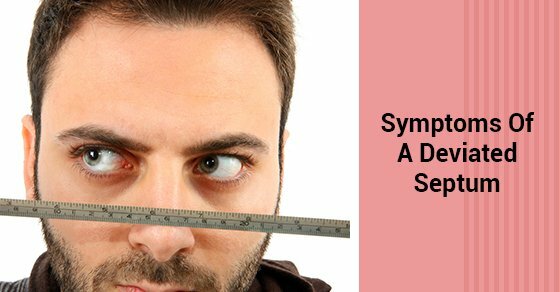 The symptoms of a deviated septum may not show themselves until later on in life or, you may notice them all the time. Here are the symptoms to look out for. If you find yourself constantly being prescribed antibiotics for recurring sinus infections, you may have a deviated septum. When the nasal passages are blocked due to displacement of the septum, it can cause sinus infections. If you weigh how much you’re paying for antibiotics per year against the cost of a nose job, it may be worth it to undergo a septoplasty reconstruction. When our nostrils are obstructed they tend to swell and narrow. For many people with a deviated septum this is especially noticeable during cold and flu season, or when allergens are present. Obstructed nostrils can make it harder to breathe and cause chapped lips and dry throat, since you will be relying more on breathing through your mouth instead of your nose. When the inside of your nose becomes dry, it can bleed. If you suffer from frequent nosebleeds a displaced septum may be the culprit. A septum that is displaced towards one side may cause the other side or, both to become extremely dry. If you find yourself favouring one side when you are sleeping, because it makes it easier to breathe, you could suffer from a deviated septum. When your septum is deviated one nasal passage is narrowed making breathing harder when you’re lying on that particular side. People who snore or breathe noisily during sleep may have a deviated septum. You may not be aware of the way you breathe at night so ask your spouse or partner. If you do have a deviated septum, it’s best to correct it as soon as possible, so as to avoid future breathing problems. The nose job cost isn’t astronomical and may even be covered by your insurance. Contact us for more information.